The clutches from Freddy&Ma are bold, modern, and – luckily for us – are categorized by pattern color on their whimsical catalog pages. 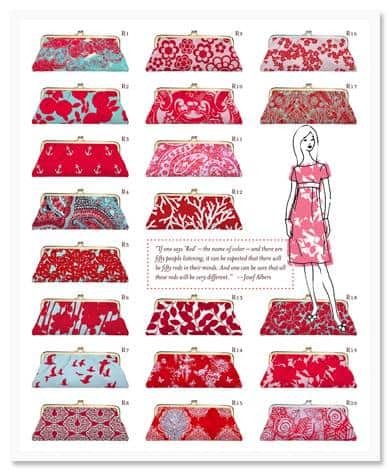 Since we just came off of talking about bridal party gifts, I feel I should mention how adorable these would be if each girl in your party got a clutch with a pattern that suited her personality in the color of your choice! If you’re looking for a way to incorporate some color into your ensemble, here’s a chic way to do it, too… and, oh yeah – they’re great if you’re only a guest, too! I love these! What a great idea. It’s so nice to give gifts that are not totally matchy-matchy. I love the idea of giving different clutches to your bridesmaids — I like anything they can actually use on the day of the wedding! These clutches remind me of Kailo Chic Handbags in Austin, Texas: http://www.kailochic.com/. They were featured in Brides magazine a while ago.